You are currently browsing the tag archive for the ‘bear’ tag. ‘Jungle Rhythm’ opens with Mickey playing the harmonica while riding an elephant, the design of which is still rooted in the silent era. First we watch Mickey dancing with the lion and the bear, then two monkeys. Then Mickey plays the saxophone with two ostriches dancing. Mickey plays the whiskers of a little leopard like a harp, while a lion dances the hula, and he even returns to ‘Turkey in the Straw’, the tune that made him famous in his first sound cartoon ‘Steamboat Willie‘ (1928). After playing’Yankee Doodle’ on five tigers, a number of apes and a lion, the crowd applauds, and the cartoon ends. 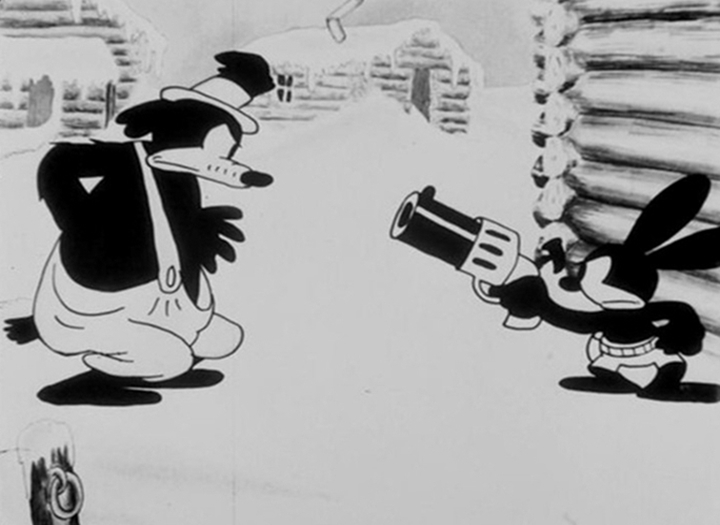 ‘Jungle Rhythms’ is easily one of the most boring entries among the early Mickey Mouse shorts: there’s no plot, no dialogue, no song, and the dance routines resemble the worst in contemporary Silly Symphonies. In fact, to me, ‘Jungle Rhythm’, together with ‘When The Cat’s Away‘ and ‘The Castaway‘ (1931), forms the worst trio of all Mickey Mouse cartoons. Luckily, weak cartoons like these remained a rarity within the series. Mikhail Kamenetsky (1924-2006) was a director of numerous puppet films made between 1965 to 1995, almost all featuring animals. In his ‘Wolf and Calf’ an old wolf steals a calf to eat, but he starts to like it and raises it like his own son. In the end, when a hungry bear, a vixen and a boar try to steal his loot, he is saved by the calf itself, which has turned into a strong bull. ‘Wolf and Calf’ is a fable-like children’s film with an old-fashioned look. The designs of the protagonists look like they have come from a 1950’s toy shop. Kamenetsky’s puppet animation is elaborate, and actually quite good, if erratic, but the film suffers from an excess of dialogue, which not always seems to correspond with the animated characters themselves. Moreover, the film’s world is rather inconsistent, stretching its believability: the wolf, like all other animals, is highly anthropomorphic and even lives in a house, alongside humans, who are afraid of him nonetheless. The calf, on the other hand, remains on all fours, and stays an animal, even though it is able to speak. With ‘Open Season’ Sony Pictures joined the American computer animated feature pool, being the fourth major company to do so. 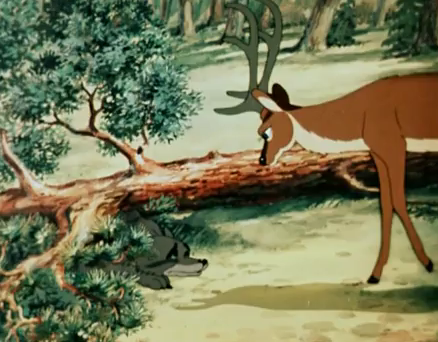 And because in this world American animation films from the same year share the same features, ‘Open Season’ is about forest animals living near the civilized world, just like Dreamworks’s ‘Over The Hedge‘. The story of ‘Open Season’ (a domesticated bear called Boog is left in the wild and tries to find his way back home) is fairly original (although similar to ‘Cars’), but like its setting, its execution is not. Like ‘Shrek’ (2001) and ‘Ice Age‘ (2002) it’s a buddy film full of fast-talking, wisecracking animals, with the sap deer Elliott (voiced by Ashton Kutcher) being all too similar to Donkey in ‘Shrek’. Moreover, some scenes are rather formulaic, like the break-up scene after the waterfall ride (see also ‘Shrek’, ‘Monsters, Inc.‘), the ‘we-can-do-this-together-scene’ (see ‘A Bug’s Life’, ‘Robots‘), and the almost obligate near-death of Elliott in the end, which goes all the way back to Disney’s ‘The Jungle Book’ (1967). The film’s designs are okay, and are more akin to Dreamworks and Blue Sky than to Pixar. The studio’s the animation is mostly of a high standard, if not inventive. The effect animation is adequate, with convincing lights, waters and smokes. Especially the furs look good, but the human hairs are very bad, and in one scene one can watch some very unrealistically animated bank notes flying around. 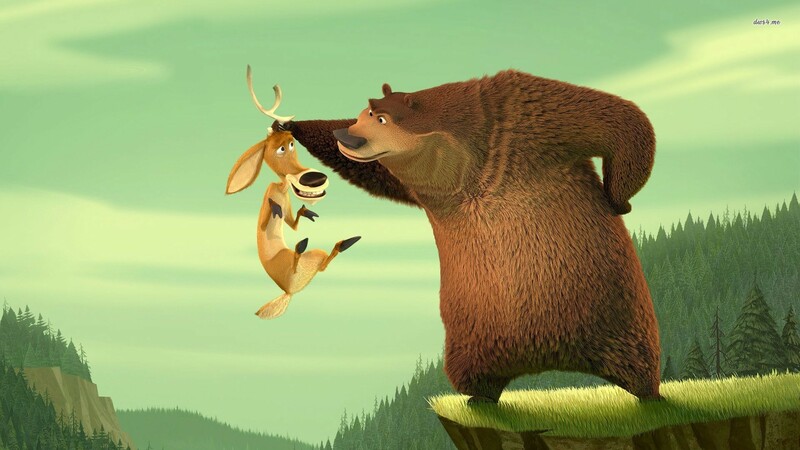 In the end, ‘Open Season’ is an entertaining film, but too standard to be a classic. Its foremost selling-point may be that it is one of those rare animated features in which the main protagonist (Boog) is voiced by an Afro-American (Martin Lawrence). After this modest start Sony Animation would do better with its next feature, ‘Surf’s Up’ (2007), with its ‘documentary’ style. But the company really hit its stride with ‘Cloudy with a Chance of Meatballs’ (2009) with its overtly cartoony animation approach. Based on a comic strip, ‘Over the Hedge’, Dreamworks’s sixth computer animated feature, is a charming, if unassuming film, which belongs to the better half of the Dreamworks features, if barely so. Unlike the unappealing movie ‘Shark Tale’ (2004) for example, all the actions of the characters have their origin in real animal behavior: they hibernate, they forage and they’re threatened by a human environment to which they have to adapt. The film’s story is original in that it’s not found in the comic strip on which the movie is based. However, at the same time the story is not too original as it contains some standard, almost obligatory scenes, a feature that hampered more and more American animated feature films from 2005 on. Nevertheless, the film’s story is well executed: the storytelling is lean, the contrast between the two likable protagonists, the brazen raccoon RJ and the cautious turtle Verne, is well-played, as are the two villains: the mafia-like bear Vincent and the Verminator. Even the side-characters are developed enough to like and to care for them (unlike the many personas in Blue Sky’s ‘Robots‘ (2005), for example). 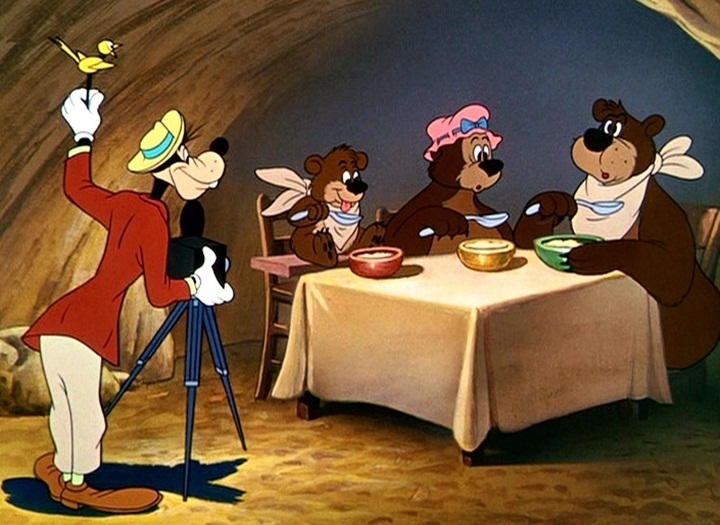 Even though it contains some very realistic effects, like the animation of fur, the animation generally is not very lifelike, and more akin to the jerky animation of Tex Avery films than to the flow of Disney. Especially, the animation of the ADHD-squirrel Hammy is frantic. This character is also responsible for the highlight of the film, in which Hammy, on caffeine, has sped so much that he sees the world practically motionless. 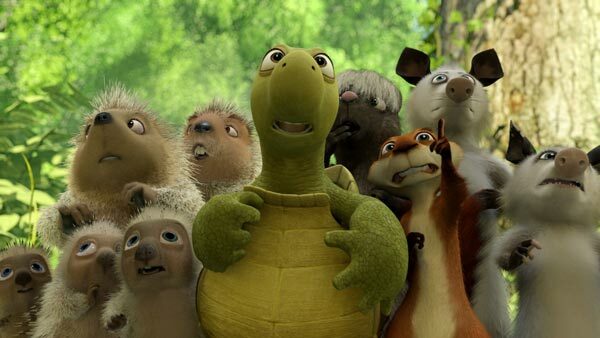 ‘Over The Hedge’ is by no means a classic, but it’s entertaining and well-told. In the world of American computer animated features this is already a plus. Five years after his first Bugs Bunny cartoon, ‘Acrobatty Bunny‘ (1946), McKimson returns to the circus setting. 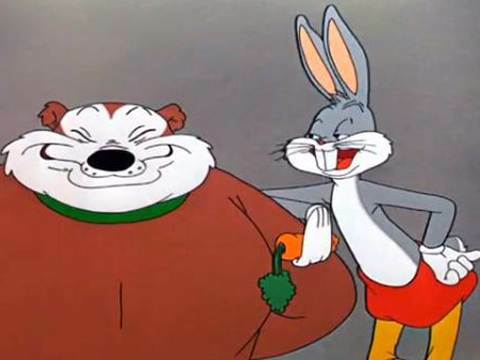 This time Bugs is the new acrobat partner of an egotistical star acrobat bear called Bruno. This “Slobokian bear” is not a good sport and tries to get rid of Bugs, but of course, the reverse happens. ‘Big Top Bunny’ is better than ‘Acrobatty Bunny’, but it still suffers: it’s worn down by the high amount of rather unfunny dialogue and its slow pace. Nevertheless, the cartoon builds up nicely, and its best gags come in last: first there’s a great cycling gag, then there’s a superb gag in which Bugs and Bruno compete in the most daring high diving act. 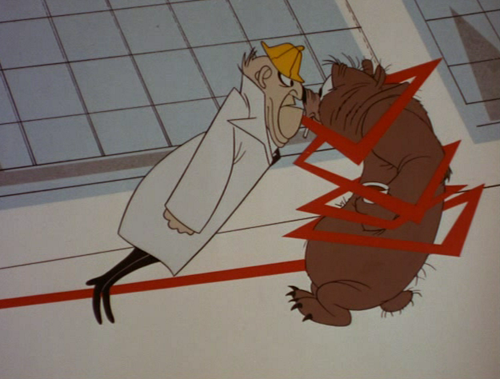 This is quickly followed by the frantic finale in which Bugs disposes of the bear once and for all.